LAKE! POOL! HOT TUB! FISHING! BOATING! VOLLEYBALL! GRILL! MOHONK! FALL SALE! WE HAVE VIDEOS OF OUTDOOR ACTIVITIES AND VIDEO TOURS AND PHOTO TOURS ON VIDEO OF OUR HOME! ONE VIDEO IS WORTH A MILLION WORDS!!! Look for the videos here in the AMENITIES SECTION or on YOU TUBE by typing THE LAKE ILLYRIA ESTATE LLC into search bar. AN AMERICAN DREAM TIME CAPSULE! Step into this amazing home and experience not only the beauty of original architecture designed by a woman architect who became an architect before it was fashionable to be one! Filled with memorabilia of the perfect AMERICAN DREAM FAMILY, this home is NOT just an empty rental facility, but you feel like you are a guest in someone's home, and their photos, their books, art-work, and collections of a lifetime are there to share with you during your visit! OUR HOT TUB OPEN ALL YEAR! If you want an empty building with just the basics and plenty of room to spread out your own stuff, then please check out our beautiful architectural delight - home number 3871453 also on this website! However, if you want a family experience, an experience of history, magic, memories and creativity; to be surrounded by 6000 books in my Dad's extensive literary library, including his own 22 original novels and books of poetry, my Mom's mini sculptures scattered around the home, my paintings and artwork in every room and CDs of my original music, then this house may be for you! If you want to experience being a guest in the home of a truly remarkable family (mine), wherein two creative and ambitious individuals (Mom and Dad) came to this country with NOTHING, not a penny, having come from starvation, world war II total devastation and the massacre of generations of family... to come to America and build this Amazing Dream Estate, it is truly wonderful to see and experience the drive, the creativity and the inspiration of two broken hearts, yet driven to get the most out of life, to squeeze out every single drop of possibility out of living... and they did it! This house still has some of our belongings in it. Our other house is doo-dad free and is now a photos-by-Iris (me) canvas gallery of nature photos I have taken while walking my dog. If you want a hotel experience, this house is definitely NOT THAT! It is our home!!! But this house... this house is not only a building that is pretty and perched on a hill overlooking a lake that my mother dug up and filled up by herself... This house was a dream seeded in the mind of a 13 year old war orphan that was working in the copper mines in Sibera so many moons ago! My Mom built this lake by digging and stopping up a stream for a three years till it filled up. My Dad, named it Lake Illyria, from a very special place in one of Shakespeare's magical comedies where very special things happen. Maybe we can remember his remarkable 91 years of life by reading this dreamy comedy while gazing at the lake and wondering about the name... hmmmm... Lake Illyria! Maybe during your stay, you will be floating on the lake on a Kayak gazing at the stars or at a blue sunny sky with an array of crazy clouds drifting... and wondering about your own magical journey of living? Our fabulous 6000 square foot architectural gem and one-of-a-kind unique and glorious private estate on 24 acres of wooded land neighbor to thousands of acres of state park natural preserves forest land just under the cliff of the famous mountain climbing hot-spot of the shawangunk mountains... Neighboring 21,160 acres State Park Minewaska and bordering 17,000 acres of Mohonk Preserves woodlands and 6400 acres of Mohonk's Nature Sanctuary, this fabulous estate is just minutes away (a bicycle ride!) from the some of he most beautiful parkland in the entire country. Not only that, but we are minutes from the climbing cliffs and the peaks overlooking the entire beautiful wooded parkland that we are surrounded by! There simply are no views to match the ever changing sunsets over the cliff, dinners on the terrace-porch overlooking the lake, night-caps on the romeo-juliette terrace off the master bedroom suite, master jacuzzi tub and sauna in the master bathroom and also an outdoor jacuzzi by the pool, also overlooking the mountain. So, there is swimming in the lake and a row-boat, and a dock and a neighborhood dude who brings kayaks and bicycles up to the house (for a small fee...) and he also guides nature snow shoe hikes in the winter, cross country skiing, and he is also a hiking guide and more... how cool is this?!?!?!? We are neighboring both Lake Mohonk and lake Minnewaska. Our estate is smack in the middle of every type of outdoor sport and entertainment possible in this area. From horseback riding, to sail boating, to mountain climbing, art-fairs and music festivals in Woodstock only a few miles away, and so much more. There are also horseback riding farms in the neighborhood starting as close as 1.6 miles from our home. 4.1 miles from the center of New Paltz with mini malls, shopping centers, small adorable artsy shops, the local college, movies, unique restaurants, the water-street market with cafes and antique shops... and everything else you could possibly need, this majestic and ultra private estate is also only 75 miles to midtown Manhattan and an easy skip hop and jump from north jersey as well. This home is open, beautiful, light, bright and airy. Hand build stone fireplaces in the master bedroom, dining room and in both living rooms spice up evenings by the fireplaces. You know, my Mom and Dad dragged each and every stone that you see in those stone fireplaces from around the land to be able to build these magnificent hand-made stone fireplaces and main wall that you see the entire home gloriously hanging from. So when you sit by the fireplace deep in the winter and gaze into the flames... allow your eyes to wander and remember the footsteps and lugging of each and every stone by my Mom and Dad... what on earth got into them, who knows... why were they driven to build this beautiful stone wall in the middle of their home? Who puts THREE FIREPLACES in their home jutting out from this magnificent effort that they made personally by lugging all these stones into a pile for the mason to put together. Well, I certainly could never tell you what possessed them, but they did it and all the stones, each and everyone of them, was dragged onto our land by an ancestor, maybe an Indian, maybe a settler??? Well, when you come to visit our home... stare at this wall and know... that two young people in love, who had no one but one another, somehow decided to build this wall and these fireplaces that now stand on this mountain top overlooking this magical Lake Illyria, under the peaks of Mohonk and Minnewaska, just for YOU to now enjoy. I don't think they knew this at the time they were dragging those stones around, maybe they thought it would be just for them... but my Mom knows it now... and my Dad... from where ever he floats... maybe his spirit still visits his library... maybe he knows it too... well... I know that I put this advertisement out to share this amazing beautiful stone wall with 3 glorious fireplaces, perched on our mountain, overlooking the lake that Mom built and Daddy named, and that all of us decorated and that I now bring to YOU to share the magic of our family, our love for creativity, our love for art, literature, music and nature, we now are sharing with YOU. And I look back now at my Dad and his dreams, and my Mom who never thought her home would be enjoyed by so many... and I am happy to know... that they continue on, each and every day when people like you come and relax, have dinner overlooking the lake by the fireplace while listening to our choir of crickets... and I know... their dreams and efforts live on way beyond their own private lives. They live on through you and your enjoyment of the dreams that they brought to fruition! Me and Mom welcome you to come and visit our truly unique and one-of-a-kind unique and unusual spots. I promise you, there is no other "house" like it anywhere! Our vacation rental is an EXPERIENCE. Besides the basic swimming pool, hot tub, lake.., it can, if you let it, become a very interesting excursion into becoming a personal and private guest of our very special and one-of-a-kind family. I look forward to inviting you to be a part of our extended guest-renter-family! PS we have a security deposit charge of $2500 on this house that we do not list in the pricing because it shows up as a fee instead of a REFUNDABLE deposit that comes back to you within 2 weeks of your stay. Please remember to be in touch with us about this. THANKS! I am the daughter of the architect that designed and built the home. She is now 94 and the house is too big and too much for her alone. We do come here when the house isn't rented so some of our personal belongings are still in the home. We do push them aside to make room for you! We share with you, our place to heal, be quiet, relax and be with nature. Swim in the lake or pool. Relaxing picnics on the dock or deck and completely unwind from stress. Please be aware that we still use the house from time to time for ourselves when not rented to vacationers so many of our own personal items are still in the home, including 6000 books in the two libraries, some clothing, all sorts of kitchen items; some you will use, some you might not use, art work, decorations and supplies. If you want a totally empty rental, please check out our other home around the corner - home number 3871453 also live on this website that is a 6 bedroom home and has no personal items in it whatsoever. When you stay at our home, you feel like you are a friend staying over. You will feel connected to our family history and legacy of music, art, literature and architecture. We welcome you into our history! ALSO please know that I am always available during rental periods by phone and email and both my house keeper and handyman are less than 15 minutes away if you can't find something or don't know how to work an appliance! HOT TUB OPEN 24/7 ALL YEAR!!! The house is light and bright and secluded. Great for a honeymooning couple, great for a family that wants to rowboat, fish, swim and spa without crowds and other people around. The windows have see-through panels instead of traditional curtains so that it blocks the glare of the sunlight while still allowing you to not feel boxed in. What does that mean? It means that you always can see the fantastic views! Our home is LIGHT! BRIGHT ! AIRY! and there are views from every window in every room! Great for mountain climbers who want to be close to the cliff, or cross country skiiers or those who love to hike through the woods since our land borders Mohonk Trust and is only 5 minutes from Miniwaska Park as well. HOT TUB OPEN 24/7 ALL YEAR!!! 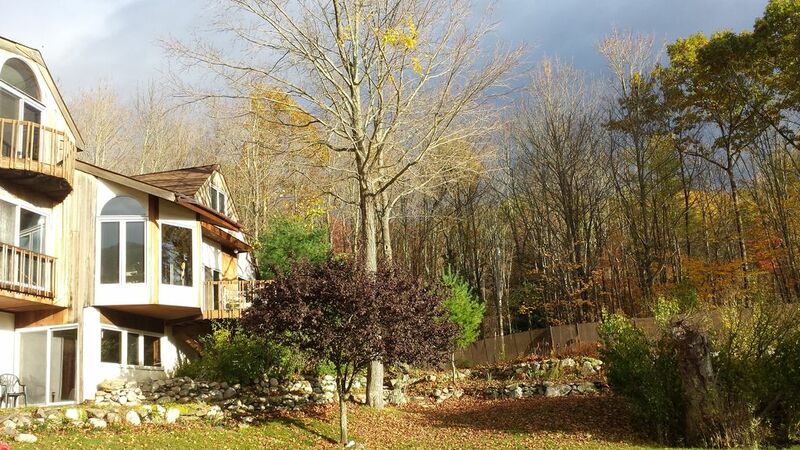 LAKE, HOT TUB for 6, POOL, SAUNA, JACUZZI inside for 4, GORGEOUS HOME, VIEWS everywhere, fireplaces, library, deck overlooking the pool and lake and cliffs, incredible sunsets, just minutes away from thousands and thousands of acres of state park. Secluded on 24 acres of wooded estate. With all the amenities of your home, you aren't just stuck in a small hotel room, you have bedrooms, a living room, dining room, kitchen and so much more. And... it's personal. You are together with us and our history, our family history being one of the unique things that many renters have enjoyed, looking at our pictures, our original artwork, my Dad's books, my Mom's sculptures, my paintings and antique 24-track-recording tapes and so much more! JOIN OUR FAMILY ON YOUR NEXT RETREAT, even though we might not be there, our feel, our vibration, our things, you can become a part of our family, even if just for a weekend or 7-10-day holiday. In addition, one of the great things about our land is that we sit on water springs (that is how we got our fantastic lake!) and one of the wonderful health benefits of having your own natural well and spring water is the natural minerals that come with it. One of our minerals is Sulfur. Sulfur has been used medicinally since ancient times, and it is contained in every cell in your body. It is a component of three different amino acids (the building blocks that make up protein). Approximately 0.25 percent of your total body weight is sulfur. It is most concentrated in keratin, which gives you strong hair, nails, and skin. It is known as "nature's beauty mineral" because your body needs it to manufacture collagen, which keeps your skin elastic and looking young. Just a few days at our LAKE HOUSE and soaking in our spa and swimming in our natural spring lake could have wonderful health benefits for your body and well being! combination tub/shower, tub, shower, jetted tub, Sauna, shower, jacuzzi tub for two, wrap around views! toilet, shower, Our home has FIVE bathrooms. Entry from outdoors! Downtown New Paltz - just 6 minutes away has all the shops you could ever need, including a variety of restaurants and a movie theatre. Our land borders the famous Mohonk Mountain House and their thousands of acres of park land. We are just 10 minutes away by car if you want to go to their parks for the day. WE are 4.3 miles from the town of New Paltz. We have our own beach right on our own private lake and also a dock and rowboat, Great for fishing and swimming in the lake. We have our own private lake with beachfront and dock, and rowboat, fishing gear and floating devices. We have fantastic views of the Shawangunk mountains and the cliff hangs out right in front of our home. There are tons of cross country ski trails all around our land. Great place for cross country skiers. Central heating cooling system can be adjusted to taste. Yes we have sheets you can use. Huge living room with a large wall of glass overlooking lake and mountain and cathedral ceilings with skylights and glass door to deck over lake and pool. We have 2 living rooms! Full eat in kitchen with all the modern amenities - gas stove top, microwave, blender, dish washer, plates, dishes, glasses silverware, pots and pans etc. A very full kitchen, my Mom great cook! big dining room with a wall of window overlooking the lake and pool and mountain and adjacent to wood burning fireplace, very romantic. Dining rm table seats 13, extra round tables add up to 24! There is a stereo in the Living Room. Plays cassettes and old vinals and CDs. The den houses about 6-7000 books, it is all to wall books. Baby Grand Piano in the Living Room, Steinway Upright in the Library, great for sing-a-longs! Huge lawn with loads of flowers around the pool and edges grace the edge of the lake behind the home. ALSO huge lawn on other side of the lake where the dock is. In New Paltz, just 4.3 miles away, there is the Walkill river that you can kayak for miles, You can rent Kayak boats in New Paltz and put into the lake or the river. A nearby dude that we know rents out bikes if you need the. He also rents out boats. There is a rowboat that you can use in our private lake for boating and fishing and rowing. Beautiful large deck overlooking the pool and the lake with table for eating, chairs, bed-chairs, incredible views. There are fishing rods available if you want to catch and cook yourself a wild fish for dinner. Row Boat and Oars, Floating devices, floating chairs for on the water. The area is splattered with places for cross country skiing and there are some beginner slopes 5-10 minutes from the house. Hunter Mountain is 90 minutes away. We have indoor table tennis (mini table) and outdoor table tennis in the park. We have pool volley ball and regular volley ball in our park. Private swimming pool only for people staying in the home. ALSO PRIVATE LAKE FOR SWIMMING FISHING, BOATING AND FLOATING! We close the pool when night temperatures drop below 45 degrees. Outdoor hot tub - seats 4 - just outside the pool, is heated. ALSO there is an indoor jacuzzi hot tub in master bedroom for 2. Second time staying at this beautiful home. Host is great and quick to respond to any questions or concerns. Highly recommend booking a stay here! We had a wonderful time this Thanksgiving weekend. The home was spacious enough to accommodate our very large family and working with Iris on the arrangements was stress free. I am thankful I found a place for our needs and thank Ester for allowing us to stay in her home. The family loves Lake Illyria Estate. An Iris is a sweetheart. Even though the weather was so so, we still had a great time. We rented kayaks and they were a big hit. Caught a few fish and released them. New Paltz is one of the most beautiful places on earth. I went to college here and have been returning every year for the last 55 years. The house is beautiful, spacious and cozy. All of the amenities are just like described and all were in great working order. The heated pool and the hot tub were an amazing treat on a chilly fall weekend. The views from the house are incredible and it is very close to a favorite hiking spot - Minnewaska State Park. Will definitely book this home again. It was wonderful to spend time with our family of 15 at this location for 10 days. There was plenty of room for all of us to be together without overcrowding. The house needs updating and some TLC. Thanks Eileen! Thanks so much for your feedback! My family of 9 adults, 2 toddlers and 2 dogs enjoyed a wonderful week here in early July. The setting is stunningly beautiful, with the cliffs and the woods. I don't think we ever saw so many fireflies, making the trees look like Christmas trees, and the stars were fantastic. There are so many things to do in the area, we didn't come close to hitting everything we wanted to. Besides enjoying the property, we visited a water park, a bourbon distillery, and went line dancing in town. The pool was delightful, and we enjoyed the lake, especially fishing for the bass which were plentiful and delicious, and also using a family size inflatable raft we brought with us. If anyone wants to fish with worms, bring your own, as bait shops are distant. The house is spacious and comfortable. We enjoyed the many books, which included a large selection of literature. Iris was very helpful and responsive, and when we needed assistance the handymen came quickly and took care of everything. Thank you, Iris, for opening your very interesting home! This is our private home and all the items inside are very dear to us. We are happy to share our things with renters with the understanding that they will care for our house and our furniture, artwork and other personal items that are still in the home, as if they are our guardians and also leave them all there intact as they found them. With that agreement we open the doors to our home.